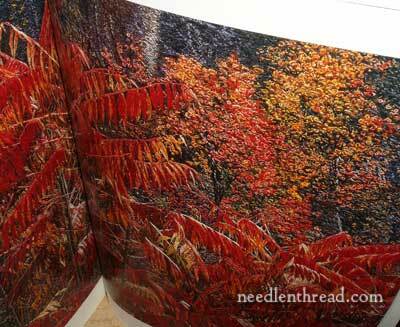 Last week, I had the pleasure of showing you a few samples up close of some gorgeous needlepainting from Su Embroidery. In the comment section of that post, Suzanna beat me to the punch on today’s blog post, which focuses on a book called Threads of Light. If you’re interested in textiles, and especially if you are interested in needlepainting, or the history of textiles in China, or silk embroidery, or the embroidery Suzhou, or photography – or a combination of all of the above – then you may very well find this book right up your alley. 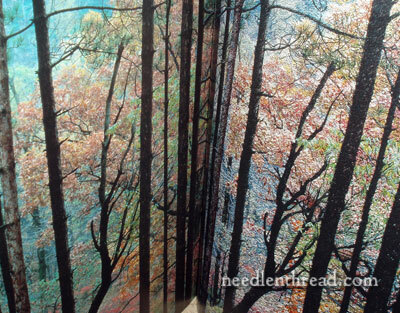 Threads of Light is not an embroidery technique book. You won’t find any “how-to” information here, or any projects to stitch, or anything like that. This is a book for those who are interested in textiles, textile history, cultural and social history, and photography. It combines the work of scenic photographer Glenn Ketchum with the history and present (1999) circumstances of Suzhou embroidery. 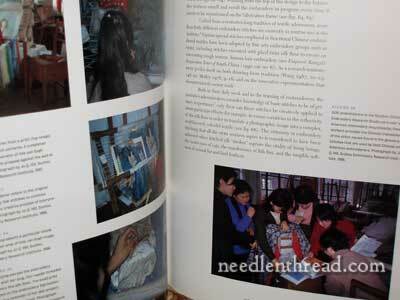 The book was published in conjunction with the 1999 Threads of Light exhibit at the Fowler Museum at UCLA. What you’ll find in the book is beautiful art and interesting reading material. If you had a chance to see the Threads of Light exhibit in 1999, then you’re a lucky duck! But for the majority of us who didn’t, the book gives us a glance at what it was all about. The “visual” concept is rather simple: the photography of Glenn Ketchum is lined up with needlepainted reproductions of his photographs. But you can imagine that this was actually no “simple” task. It took years of collaboration to pull the exhibit off. 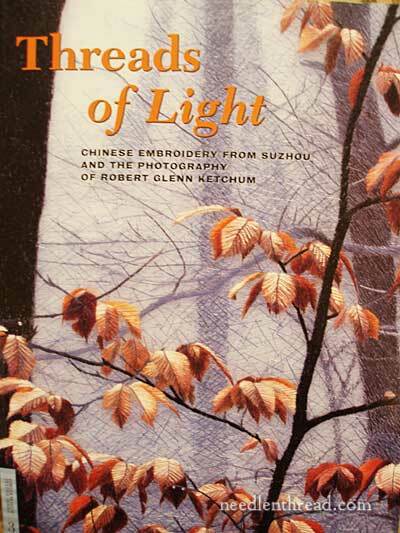 The book details not only the work involved in the translation of photography into needlework, but it also explores the work of the Suzhou Embroidery Research Institute and the rigorous training involved in becoming a master embroiderer. Glenn Ketchum’s photography is fantastic. You’ll find plenty of gorgeous samples of his work on his website, if you want to get an idea of what his work is like. Even if his work were completely divorced from needlework, I would still find his photography compelling. In the book (and under “textiles” on his website), you’ll see his photographs lined up next to their embroidered counterparts – and wow! It’s amazing to see! I can imagine that seeing them lined up together in real life would have been a superb visual treat! In the book, you’ll discover how the embroiderers who create this type of needlepainting are trained and how and where they work. 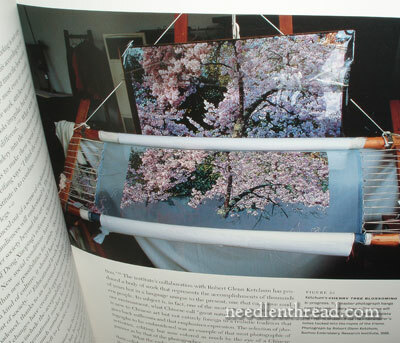 While reading about the history, techniques, and training behind Suzhou embroidery, you’ll be treated to photos of the workspaces of the embroiderers, the threads they use, and various works-in-progress shots. This is one of my favorite photos in the book. The embroiderer is working on an embroidered counterpart to one of Ketchum’s photographs. Note the sheer fabric – you can see her hand clearly underneath it. I love looking over the shoulder of other embroiderers. I think this is a fascinating book. Believe it or not, I didn’t buy it just for the pictures!! (Sometimes, I do that. Don’t you?!) I bought this one to read up on this style of embroidery. Do you know, there are some 44 different stitches involved in Suzhou embroidery? It’s not just the random straight stitch or long and short stitch. Oh, don’t get me wrong! I’m not planning on taking up Suzhou embroidery (I seriously doubt I could ever do it well or do it justice!) 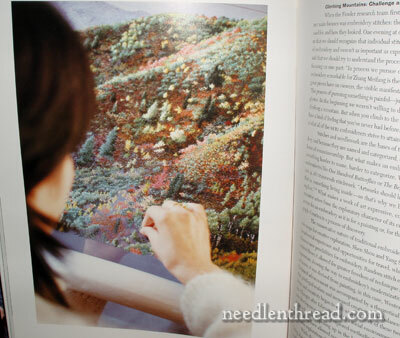 – but there’s a lot to learn from different techniques and different cultural approaches to embroidery, and that’s why I bought the book. If you’re interested in the book for your own research or study purposes, you can find Threads of Light new through the Fowler Museum, where it’s on sale for $19.95 instead of $45. Or you can search various used book sources and find it for a little less. I am so glad you posted about this book! This is one of my favorite books – in fact, I keep it in my office so I can look through it during “tough” times. I highly recommend it for anyone who wants to “push” to the next level of stitching. I’m so happy to read your review of this book! … It looks I did beat you to the punch in my all over excited post the other day 🙂 but as always you did real justice for what the book is all about. I love to read your book reviews as they put me right between the pages and makes my decision making much easier when it comes purchase or not. Thanks for the beauty you bring to my life !!! Previous Previous post: Wool Embroidery Project: One Leaf. One Lousy Leaf.